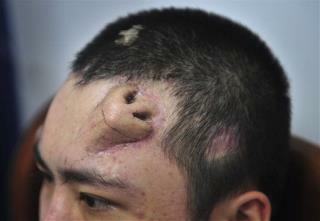 (Newser) – A 22-year-old man in China needed a new nose. So a surgeon has built him one ... on his forehead. The surgeon, Guo Zhihui from Fujian Medical University Union Hospital, constructed the second nose out of cartilage from the man's ribs, then put it under the skin on his forehead ahead of an upcoming transplant to its rightful position in the middle of his face, the AP reports. Guo and his team spent three months expanding the forehead skin so it could fit the new nose cartilage; they build the nose's bridge first, then the nostrils. "We sculpted the nose three-dimensionally, like carpenters," he says. The entire process took nine months. It's a good thing his member was severed in the accident. Well it sure would be interesting to know at least a little bit about why they decided to put it on his forehead, of all places. That just seems like about the least appealing place one could come up with, other than maybe one's ar5e.